Just because I’m limiting my calories doesn’t mean I’m limiting how good my food tastes. I had my first deep fried egg in Detroit on my birthday 2 years ago, and it blew me away. I’ve made a deep fried egg before, and it works out to four points per egg. I wanted to see if I could duplicate it in the air fryer. It was tricky, but here’s how I did it. My only regret is that there wasn’t a runny yolk. I’m not sure if it’s possible to keep the yolk runny – which is why a poached the egg instead of hard boiling it – but I’m going to keep trying until I see if it’s possible. The result was delicious, with a nice crispy exterior. Nutritional info was calculated based on the breadcrumbs, flour, and egg yolk that was actually needed to make the egg. After subtracting the flower, breadcrumbs, and egg yolk that remained, each air fried egg is 125 calories. Bring a pot of water with vinegar in it to a boil, then lower to a simmer. There should only be small bubbles on the bottom of the pot. Crack egg into a ladle. Use a spoon to get the water spinning like a whirlpool, and carefully lower the egg into the middle of it. Cook egg for three minutes, then remove with a slotted spoon, and immediately place in an ice water bath. After a few minutes, remove egg from ice water with slotted spoon, and place on a paper towel. Very carefully dry the exterior of the egg. Turn the air fryer onto 375°, and preheat for five minutes. Gently dust the outside of the egg with flour. Carefully remove any excess. Whisk egg yolk in a little bowl. Carefully Roll egg in the egg yolk. Hold the egg over the bowl to allow access to drip off. Mix salt with breadcrumbs on a plate. 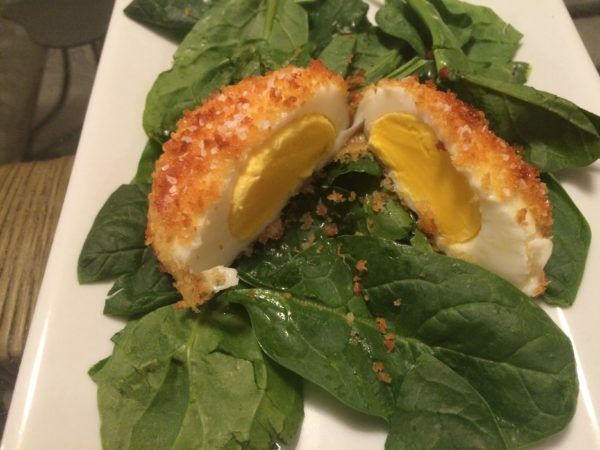 Carefully roll egg in breadcrumbs. Sprinkle breadcrumbs to cover any openings. Spray one side of the egg with 12 squirts from spray bottle. Carefully flip over egg, and spray the other side 12 times. Carefully place egg in middle of air fryer basket. Cook egg for five minutes. If it’s not golden brown, cook in one minute intervals until it is. My ultra light pesto is the key here; see the recipe linked in the Ingredients list. If you want to make this with a reduced fat pesto, it’s a 2 point (Weight Watchers) recipe. Regular pesto makes it a 3 pointer. 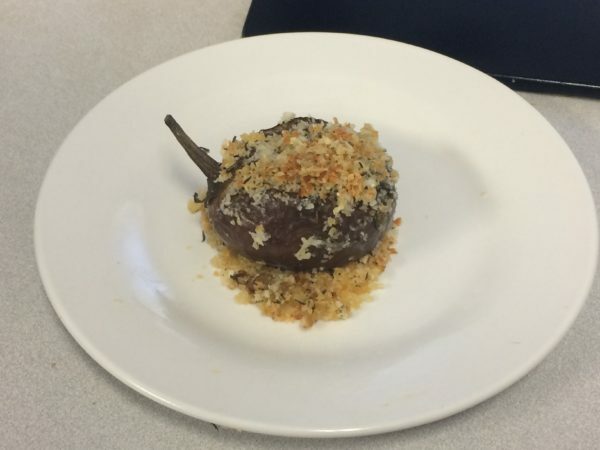 Preheat oven to 375° F / 190° C.
Wash eggplant. 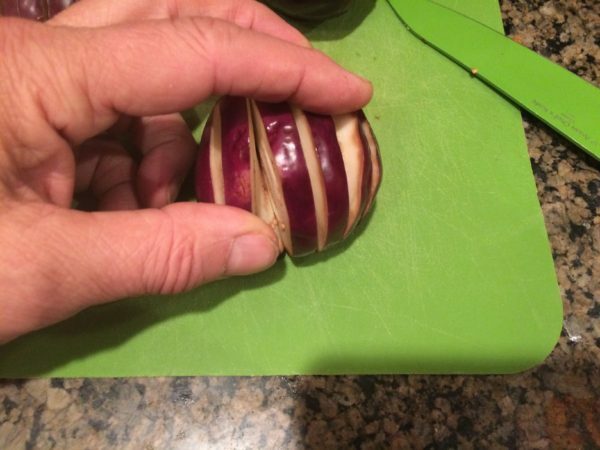 Leaving the stems on, cut each eggplant at 1/4" intervals so the eggplant stays connected by the stem. Sprinkle inside the gaps with salt. 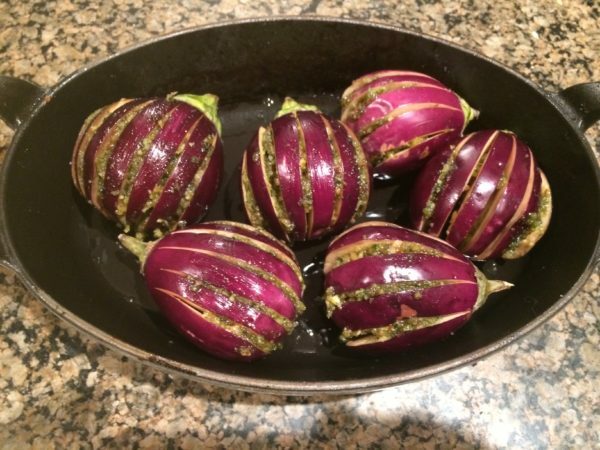 Spread pesto evenly in the gaps of each eggplant. Spray a high-walled baking pan or casserole pan with cooking spray. Place eggplants in the pan. Cover baking pan with foil. Bake for 40 minutes or until tender. Blend breadcrumbs, cheese, and thyme and set aside. Turn on the broiler. Remove the foil from the baking pan. 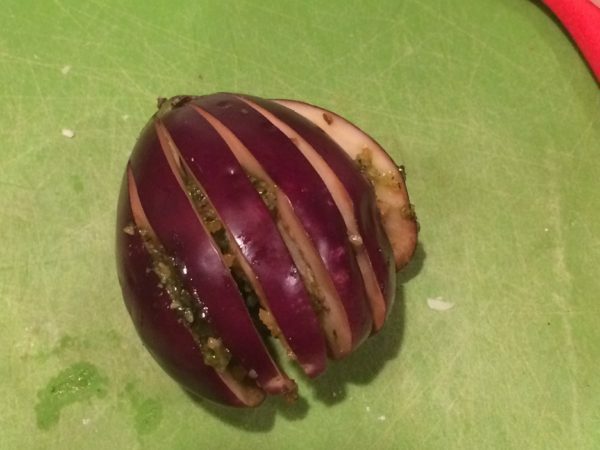 Rotate the eggplants so the gaps are facing upward. 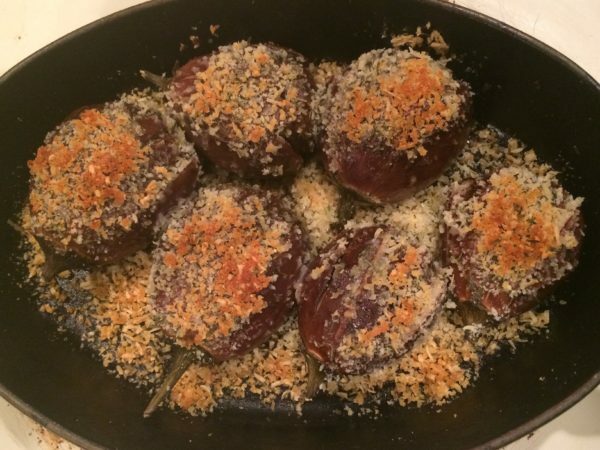 Sprinkle each eggplant with the breadcrumb mixture. Broil until the breadcrumbs are browned. 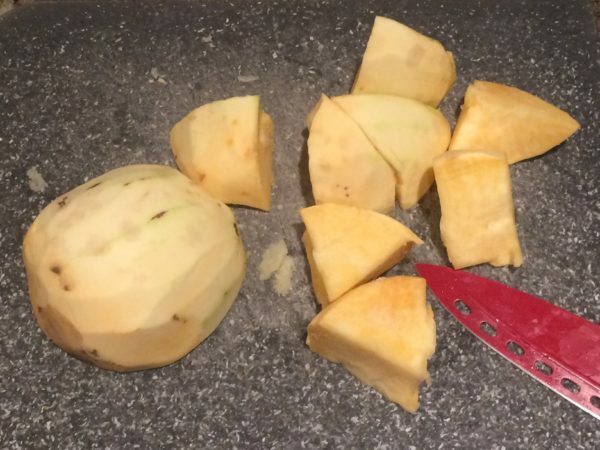 Peel rutabaga, then cut into large chunks. Boil for 20-30 minutes or until soft. Combine breadcrumbs with salt and pepper and place on a baking sheet. Cook for no more than 2 minutes, or long enough to brown them. While the rutabaga are cooking, cut bacon into small pieces and heat in a pan on medium for about 5 minutes. Add onion and sautee until it starts to turn a golden brown. Add garlic and cook for another minute while stirring constantly to prevent burning. Allow to cool, but save everything in the pan (including the grease). 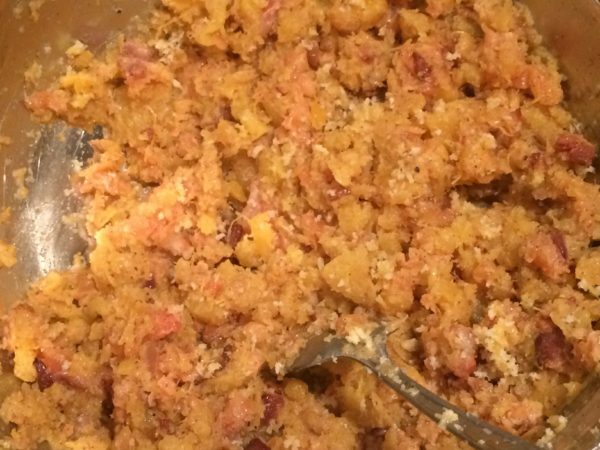 Mash rutabaga by hand or run through a ricer. Allow to cool: combining hot rutabaga with the salmon will cook it partially, resulting in overcooking in the oven. 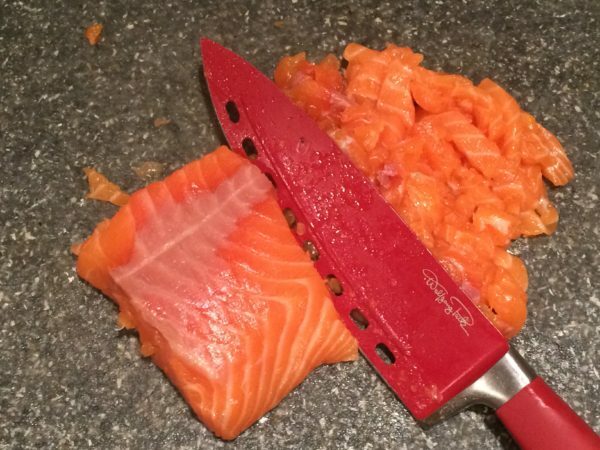 Chop salmon into small pieces (about 1/4 inch chunks). 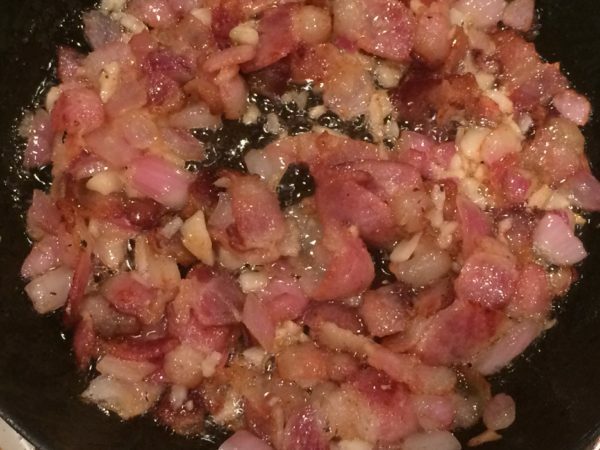 Blend onion, garlic, bacon, rutabaga, sumac, 1 egg, salt, and lemon juice. Roll mixture into 14 equal-sized balls (a little less than 3 ounces each). Place egg in a small container with a tablespoon of water and whisk. Place breadcrumbs in another small container. 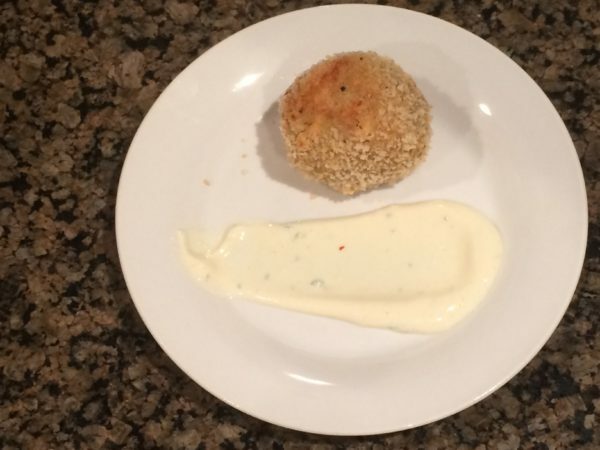 Roll each ball in the egg, then in the breadcrumbs, and place on a baking sheet brushed with oil. If possible, use a spray bottle to spray the surface of each croquette. Bake for 10 minutes, then turn over and bake for another 10 minutes. Remove from oven and place on cooling rack. Combine sauce ingredients and allow to rest for 15 minutes in refrigerator before serving.